Howdy campers, how goes your winter? Mine is going along just fine now that I’ve gotten rid of the little bug in my tummy and the nasties outside have disappeared, most of them, anyway. Right now it’s 75F outside with a slight cloud cover. It’s been a very different year when it comes to the weather and how that has affected everything here. We had 3 weeks of what’s considered winter weather, where the nighttime temperatures dropped below 40F. Though that only happened to us a couple of mornings. We’ve had our little Dickenson propane heater on exactly once and probably closed all the windows for maybe 2 weeks max. The Grande Norte has been pretty gentle with us this year with averages of 5 to 15 miles per hour on the days when it was blowing. Sure we’ve had a few days were the wind has reached 25 but not many and lots of days there’s been no wind at all! Again an unusual weather occurance! With the weather being so warm, things that normally would go into some form of hibernation haven’t needed to, hence the rattlesnake in the photo below that was making it’s way across the road just behind our campsite yesterday afternoon. On a normal year these bad boys would disappear in November and only start reappearing in March when it warms up sufficiently. We do see lots snake here but this year has been exceptional, with all sorts of different ones being seen all winter. That really cut down walking the trails for everyone. No sense in walking through grass that’s so high and thick you can’t see your feet, just in case somebody’s hiding there. You’d hate like hell to step on one of the few poisonous ones. 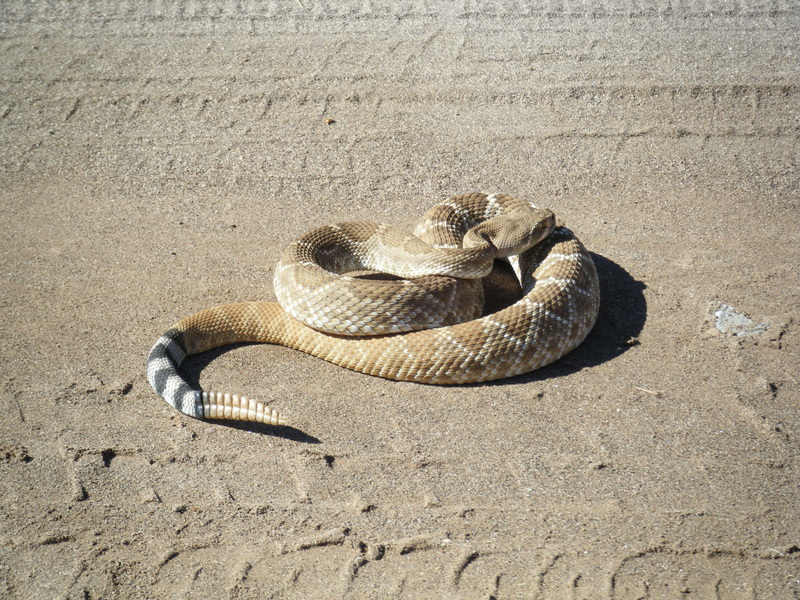 Most of the snakes here are harmless but there are several varieties of Rattlesnakes all over Baja. Not to mention all the spiders. I’ve seen more and bigger spiders this year than all the preceding years put together and there are some nasty buggers in that family down here! Have I ever told you how much I hate spiders? Probably but it bears repeating! Snakes, no problem. Spiders, big problem! 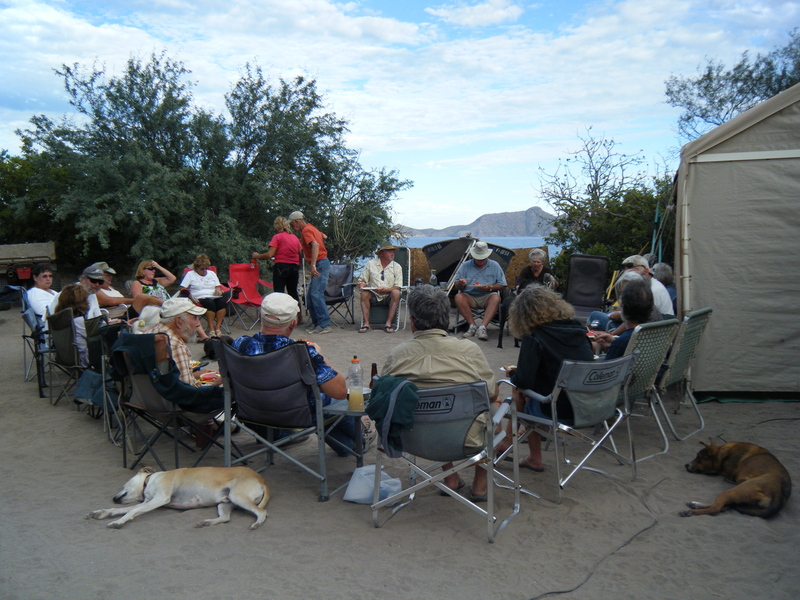 One of many gatherings this season! None of that has slowed down the social activities on the beach this year though, as a matter of fact it has intensified to the point where I figured I was cooking at home maybe twice a week. A couple of the campers came down with bigger rigs this year, which enabled them to have company for dinner inside which wasn’t possible before. So a lot of the time even if they weren’t the hosts and dinner was being provided by someone else, the actual get together was in the more spacious RV. One of the smaller spreads . You should have seen Christmas! Considering how bad the bugs were, this was a godsend! 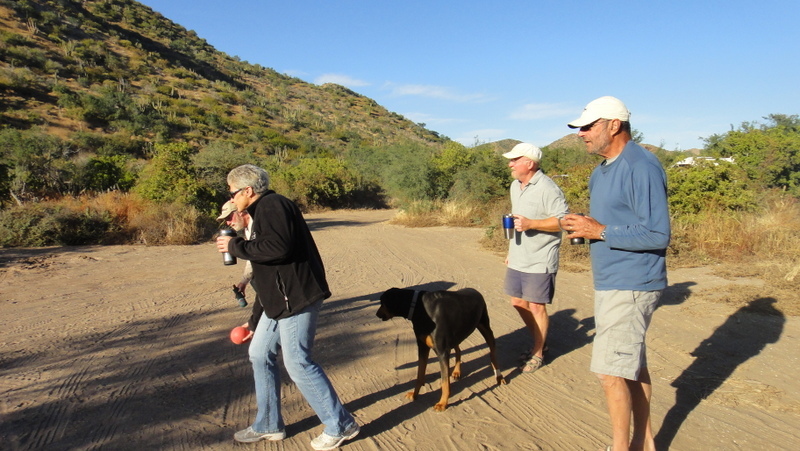 Plus we all enjoy each other’s company, so it didn’t take much of an excuse for a beach dinner to come together easily or a trip to the nearby Tripui Restaurant for dinner. The restaurant will take your caught fish, prepare it anyway you want, add on rice and beans and charge a grand total of 65 pesos per person which works out to about 5 bucks. Pretty hard to beat that eh? We’ve had 2 Thanksgivings, Pizza Night, Full Moon parties every month, multiple birthdays, (one of which was celebrated for an entire week), Christmas Eve, Christmas morning breakfast and Christmas dinner, Superbowl Sunday, Paella/ Valentines Day, which is next week, arrivals, departures, a good day fishing, or just for the hell of it and those were the get togethers that included everyone on the beach, old-timers and newbies as well. 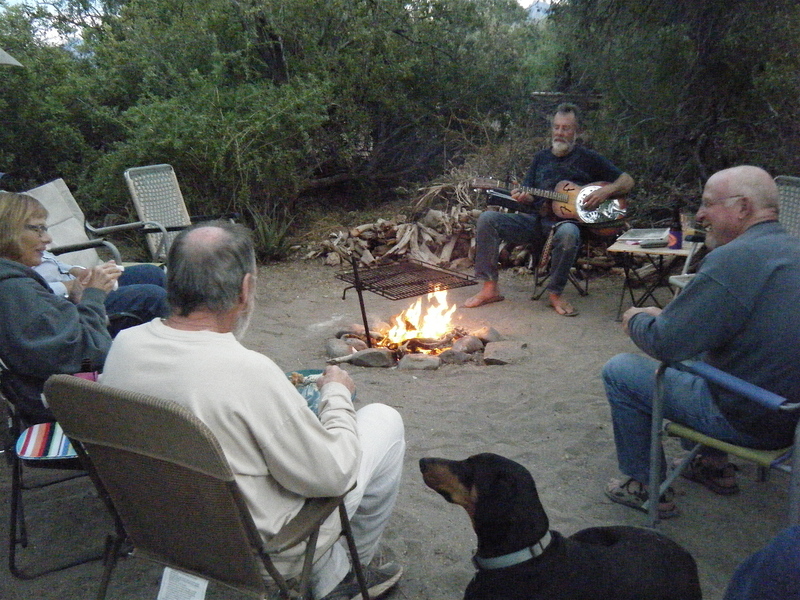 That didn’t include the various invites to dinner, or a quick potluck around a campfire that were and are constantly happening amongst the campers, or the Costillo de Puerco and Bocce Ball Club that Richard and I are full-fledged members of. 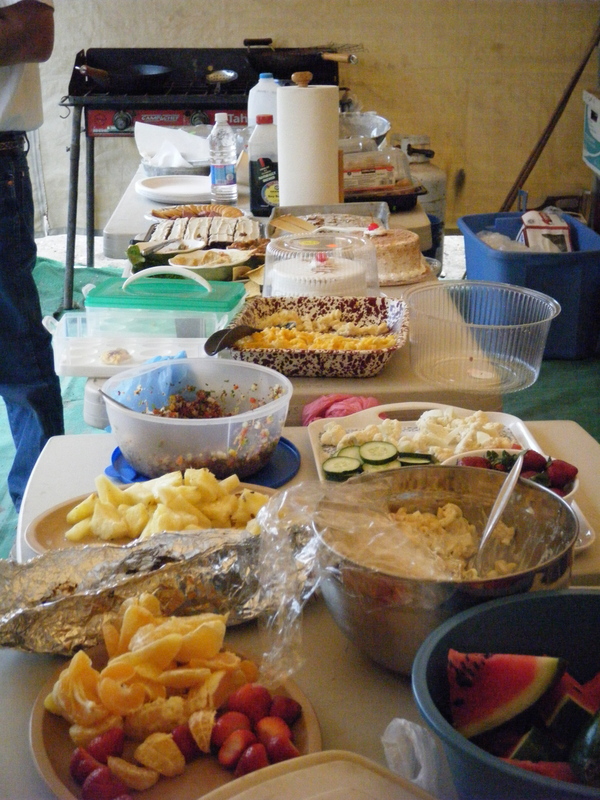 One of many meetings the club has had this winter. The Pork Rib club was started with just 5 members. 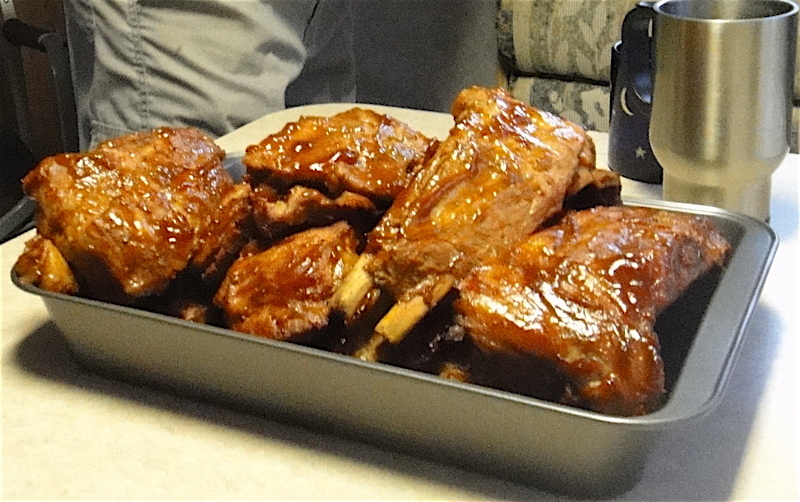 Meetings consist of preparing and smoking a rack of ribs for every 2 people, preceded by a game of bowling, the course of which we make up as we go along. Everyone is handicapped by having to carry at all times and drink a “Syarita”, a fabulous drink invented by one of the originators of the club, Sy. The ingredients remain a closely guarded secret but I can tell you that the main ingredient, tequila, is poured into each drink for a count of 8 seconds. Try that at home! The main reason for the club. Each member is responsible for hosting one round including the purchasing of the ribs, (at 65 pesos per kilo, what more could one ask?) the BBQ sauce and any pre-cooking preparations, though the smoking and consumption were always at Sy and Jan’s who had the largest venue capable of accommodating all of us. Over the winter the numbers have increased and decreased and the venue has now changed but until we all leave, every Friday, Saturday or Monday night (depending on everyone’s schedule) is set aside for the Costillo de Puerco Club meetings! We will adjourn at the end of March but the next meeting will be called back into session in October 2013. We rarely get bored since there’s really so little time to ourselves but on the occasion when he has nothing to do Richard creates new and unusual things to give the folks on the beach something to giggle about. The photo below is his latest creation. 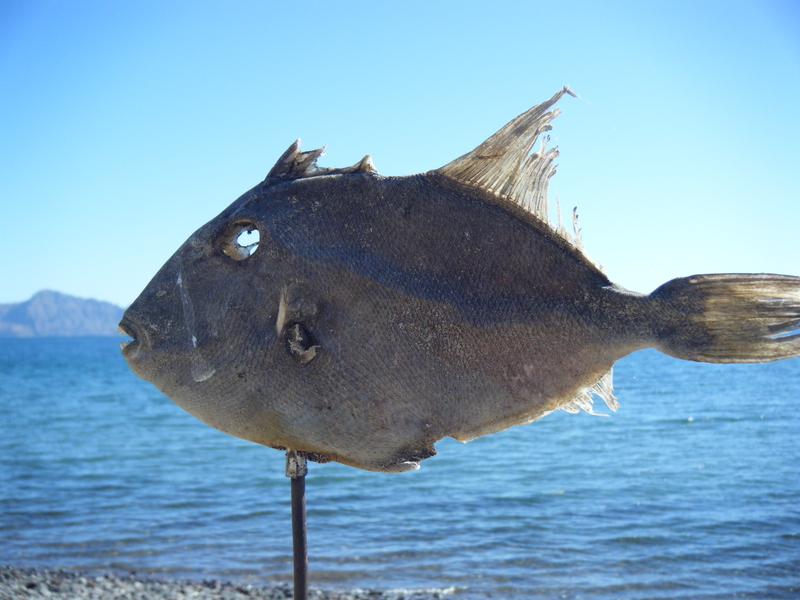 It died and washed up on the beach where it dried hard as a rock. After he put it up on the post as a nominal wind vane, he waged a running war with one of the seagulls on the beach. When the wind blows, the fish wiggled and I guess instinct took over. The gull would scoop it off the post, and then drop it when it realized it couldn’t eat it. The funny part was watching the running battle between man and bird for a couple of days. After a while it seemed as if the seagull was just playing a game as it would wait for Richard to put the fish back on the post then turn his back to go into Grummy, then it would pounce, grab the fish, drop it immediately and fly just down the beach, watching his reaction. Eventually the bird gave up or maybe the wind just died down enough to stop the gyrations of the fish, either way, this has provided a lot of humour for us and everyone who sees it. Even the Parks Wardens thought it was pretty funny! I’m writing this on Friday the 8th, and we’ve just said goodbye to our friends the Filthy Pigs, (Trust me, that’s a whole other story), who were visiting us from the Pacific side for the last 3 days, Sunday is another birthday celebration at Tripui, Monday is the weekly meeting of the Costillo de Puerco and Bocce Ball Club, and Valentines Day/Paella Potluck is on Thursday. Chances are good that something else will come up for Saturday, Tuesday or Wednesday. What can I say but, Woohoo!! I mentioned previously that the average daytime temperature down here was sitting at around 35c but that doesn’t actually tell the real story. You have to factor in the humidity levels, which are between 35 and 40 percent. Now I know that doesn’t sound like very much but oh, man does it make a huge difference. With the humidity, the actual temperature is between 40 and 45c. In other words, it’s freaking hot here! It’s so hot and humid that you sweat heavily just sitting still and there is no part of you that isn’t wringing wet all day long. Just before sunrise it’s only 22c but as soon as the sun comes up the temperature skyrockets and within 20 minutes it has reached the maximum it’s going to be for the day and it doesn’t cool down until about 3 AM. So what’s a person with lots of time on their hands to do? Why go swimming of course, or snorkeling or simply standing in the water, right? Uh, wrong. Not unless they have a full-length wet suit. Why? Well, there’s this little creature in the water here that folks call an Auga Male (that’s pronounced malay) Which translates to Bad Water in English. Now that’s probably not its real name nor have I been able to find anyone who can tell me what it really is, but it’s a suitable description. 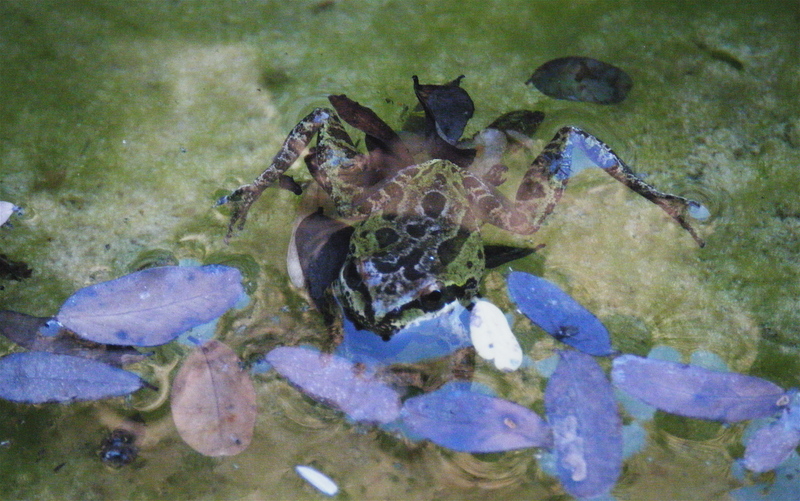 An Auga Male. Sorry, but it's the best shot I could get! These things are polyps, less than ½ an inch long, and so clear that they are virtually invisible in the water. They feed themselves by deploying a very long clear thread and when it touches bare skin, it burns, a lot! It also leaves a line of raised red welts that sting and then eventually itches like mad. Our problem is where our campsite is. 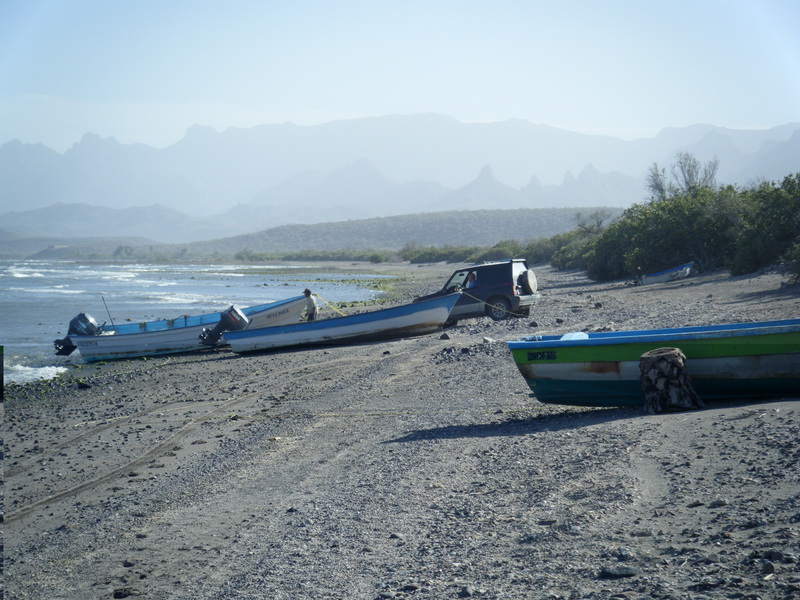 We are the last site right beside the launch ramp, so whenever any of the folks down here are trying to launch or retrieve their boats, they usually need help since all the launch ramp really is, is a gradual decline of sand into the water. Not to mention that except for ourselves, the average age on Rattlesnake Beach is 70 and up, so every day we accumulate large numbers of stings and man, are we going through limes since the best cure is warmed lime juice. Vinegar works but not anywhere near as well and I’m sorry but I’m just NOT going to try the old having someone pee on me experiment! These little nasty’s will eventually disappear when the water cools down some, but will then be replaced by a jellyfish called String of Pearls which look exactly like their name, except they are an iridescent blue colour. These too make life miserable for swimmers. All in all, though it may seem as if we’ve moved into Paradise, there is always a price to be paid for it. I got smart this year and purchased a full-length wetsuit, but have you ever tried to get into a wetsuit? Try doing it when every square inch of your skin is already wet. I know, I know, use cornstarch, but you know what? When your skin is already wet, cornstarch just clumps. So it’s a struggle and by the time I get the damn thing on, I really do need to get in the water as the sweat is pouring off me. 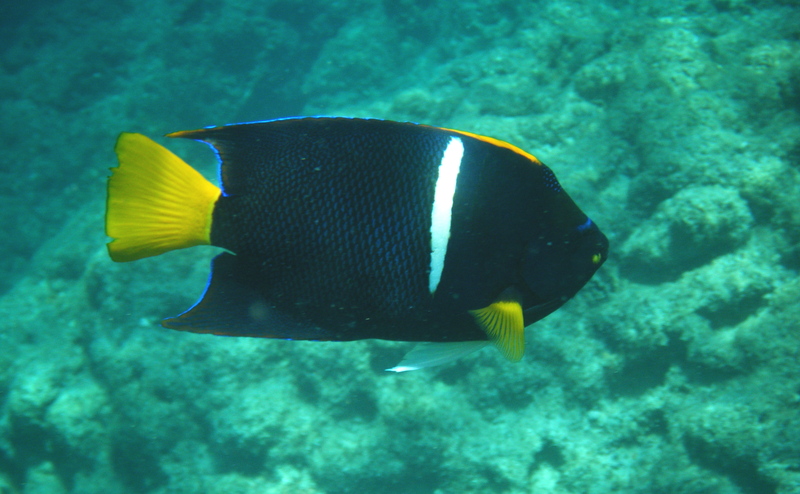 Not to mention that even a wetsuit with mask, snorkel and flippers doesn’t cover every portion of skin. The hands and parts of the ankles and face are still bare and you know, getting stung on the face bloody hurts. Considering how long it takes to get the damn thing on, when the folks need help with their boats, I go as I am and in most cases it’s just my bathing suit and me. Oh well, nobody ever said life was going to be easy. 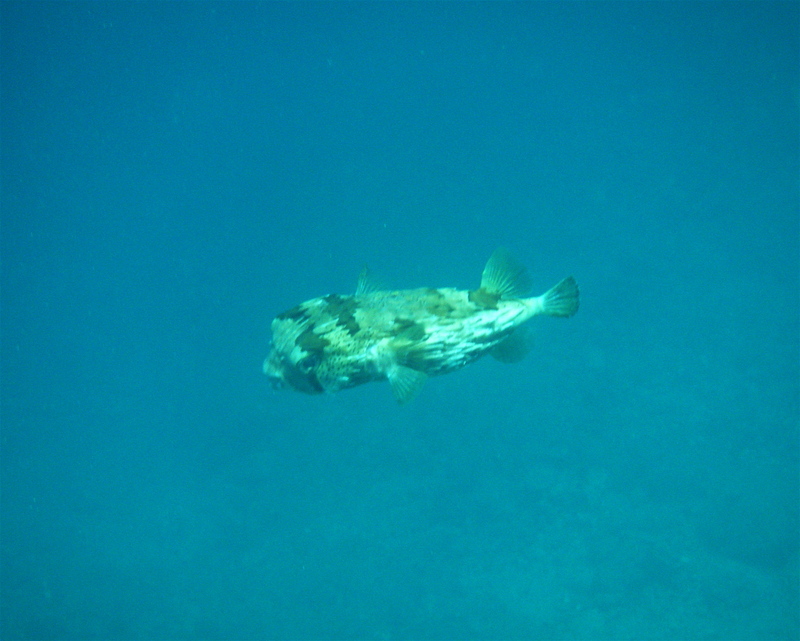 This is a Balloonfish, though they are mistakenly called Pufferfish. These little guys are anywhere there's a rock to protect. I’m sure your sitting there thinking, Jeez, what a whiner, but you know, writing a travel blog requires truth so here it is, these things are the price we pay for our little slice of Shangri-La… this year. Next year it could be a plague of flies or biting insects, a Grande Norte that blows hard all winter long or a continuation of drought that makes fresh water difficult to come by. We never know what to expect until we get here but we always know there won’t be any free lunch! The wind, she’s a blowing. The Grande Norte came back this week. We’ve been enjoying warmer weather and watching the sun rise higher in the sky everyday, but just like at home, just when you think Spring has arrived, a late season storm puts paid to that for while. So it is down here. The wind is supposed to blow all week. It’s not going to be high winds, but it makes kayaking and hanging around on the beach just too cold and uncomfortable, so we have to find something else to keep ourselves occupied. It’s time to go hiking! There are 3 canyons nearby that we can choose from, Luigi, Wow and Tabour. All are basically the beginnings of the large arroyos that dot the landscape around here. 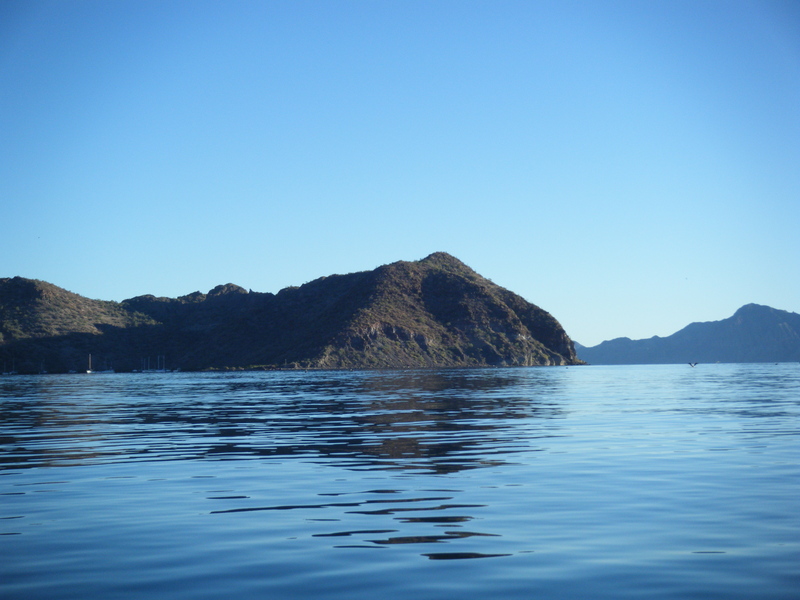 Places where the waters that fall on the Gigante Mountains are gathered and funnelled to the Sea. They are also completely different from one another. Now, I can’t speak about Luigi Canyon as we’ve never been up it. It is on private land, fenced off and the gentleman who has the key can be capricious, if you can find him. 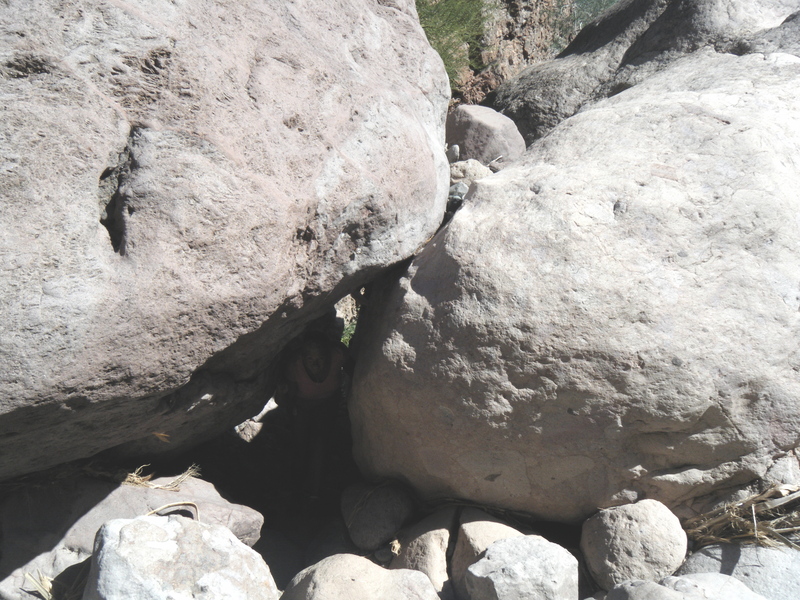 Tabour is the closest and easiest to access. It’s just a little ways further up the road from the water well that we all use for our drinking water, about half a Kilometre from the highway. It consists of boulders; some small as baseballs, some so massive you can’t conceive of any power strong enough to move them. 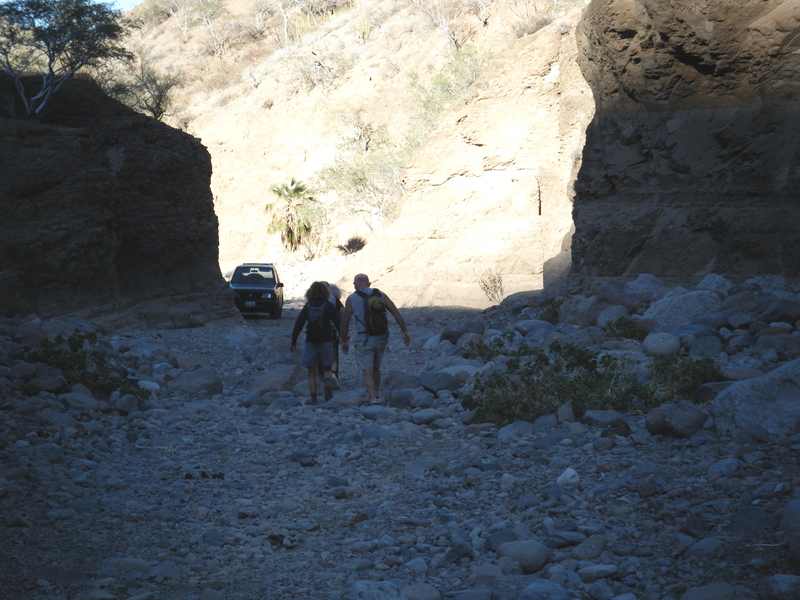 In Tabour, you do a lot of scrambling up, over and around the rocks, and unless you know the secret of the Rabbit Hole, you only get to experience 1/3 of the climb and miss the fabulous views of Danzante available further up the canyon. Entrance to the Rabbit Hole. This hike starts the minute you park your vehicle and it generally takes us about 5 hours, but that includes a couple of rest stops to admire the scenery, take a few photos or do a little yoga, (Yes, even here we’ve been known to do a few asanas) plus one long lunch break. 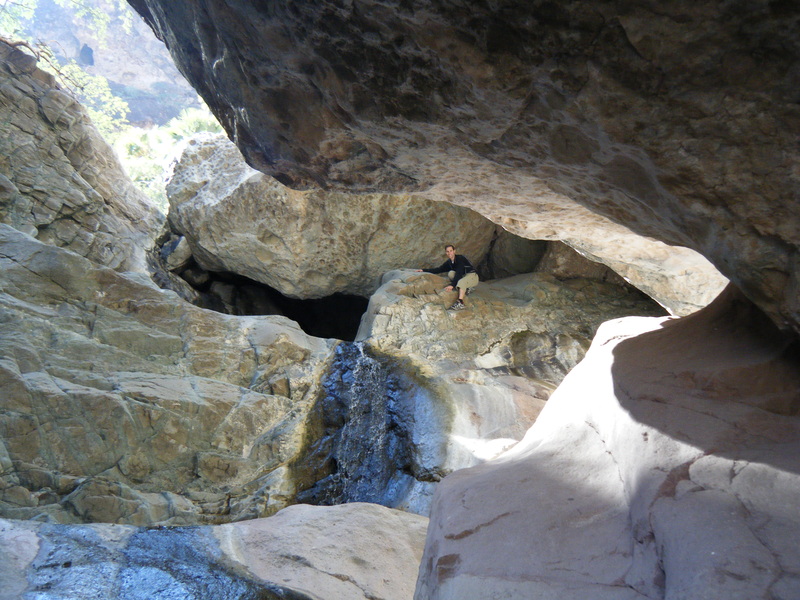 As I said earlier, these canyons are funnels for water but just as the hikes are different so is the water you find. 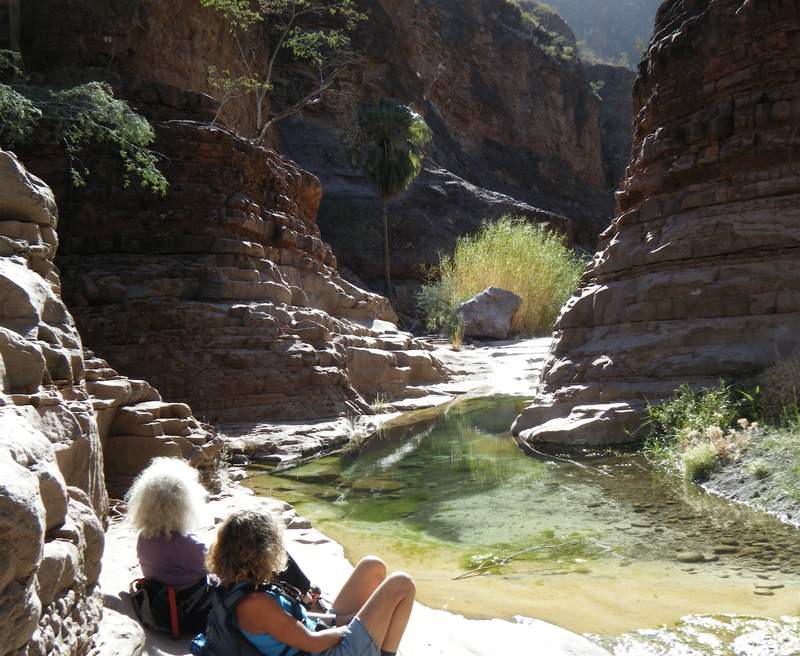 All the canyons have pools and all of the water is very cold, (though that doesn’t stop the hardy from swimming in them) but in Tabour you don’t usually get your feet wet as all the pools and rivulets can be skirted. 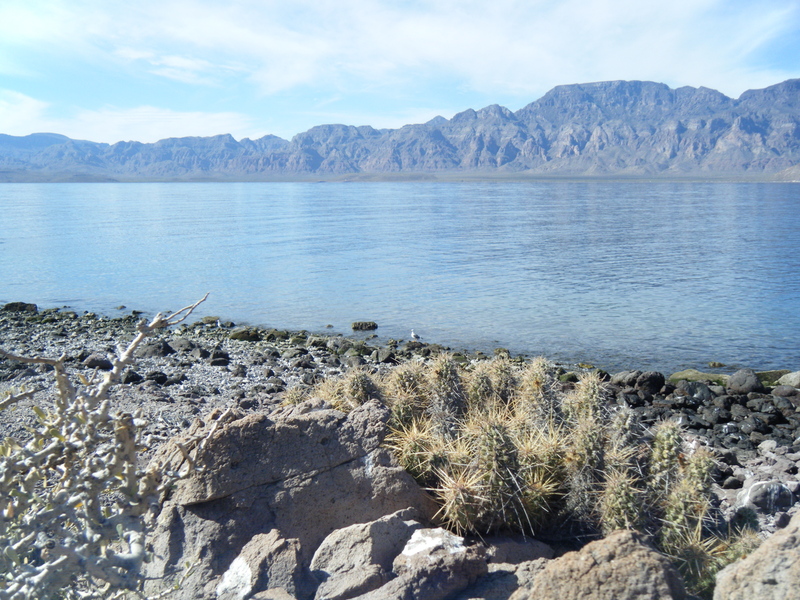 This year the water is very low as Baja Sur is in a long drought. 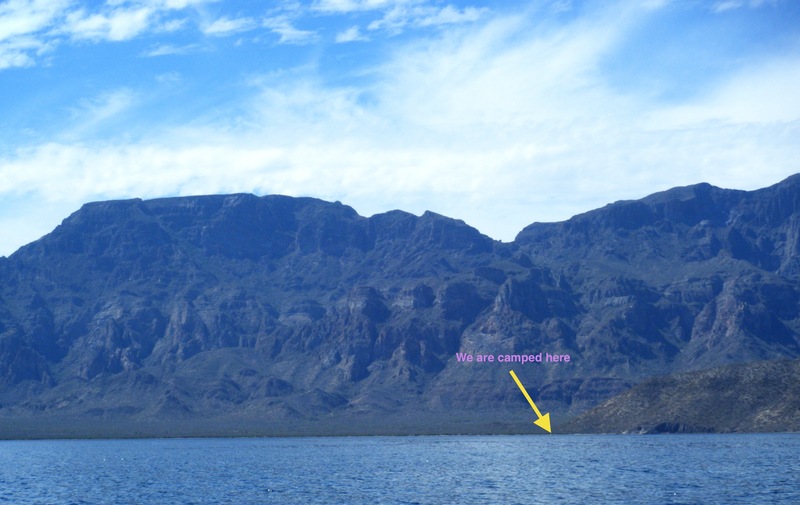 From the picture below, you can see where the water level usually is. Tabour comes eventually to an end. 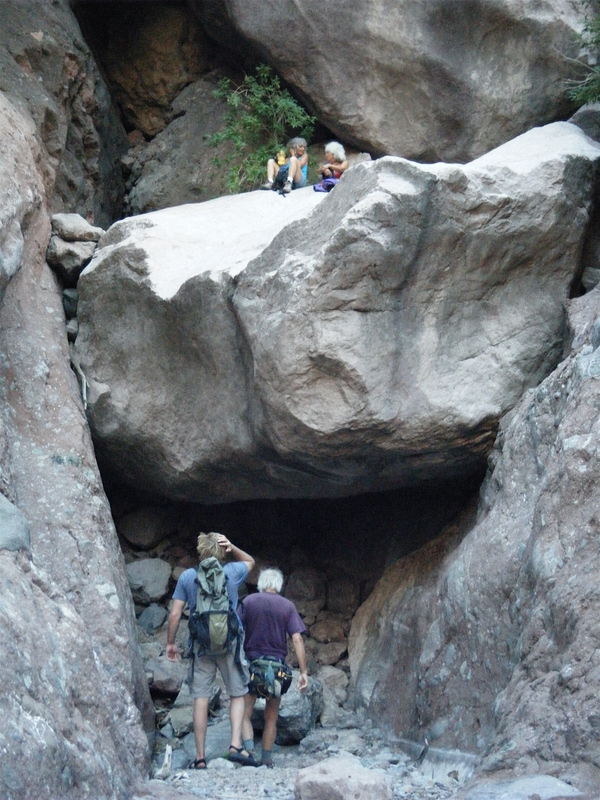 Those who are rock climbers can go further, but those of us who don’t do class 5 climbs call it quits here. See how low the water is? As far as you can go in Tabour. Wow Canyon is about 10 Kilometres down the highway from Rattlesnake beach and is reached by turning down a bone rattling dirt road, that eventually just peters out after about 5 Kilometres. 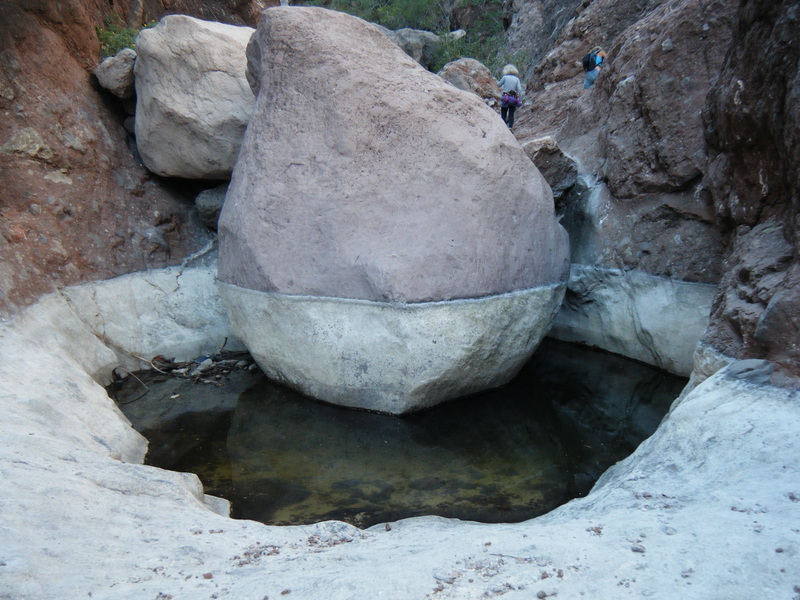 You park, start walking and just continue to walk, there are no massive boulders to overcome here, as the canyon bottom is flat and easily walked, but there are large pools of water that must be waded or swum through. This hike you get wet and I don’t like doing it until this time of year. The sun is much higher in the sky and actually shines directly down in the canyon in some areas. Any other time of year that we’re here, it’s in the shade. It doesn’t make the water any warmer but it sure dries you up a lot faster. The first fording in Wow. Wow Canyon always lives up to it’s name. None of us know what the Mexican name is for it, but it’s called Wow, because just about every corner you turn, someone in the group will usually exclaim “WOW”! 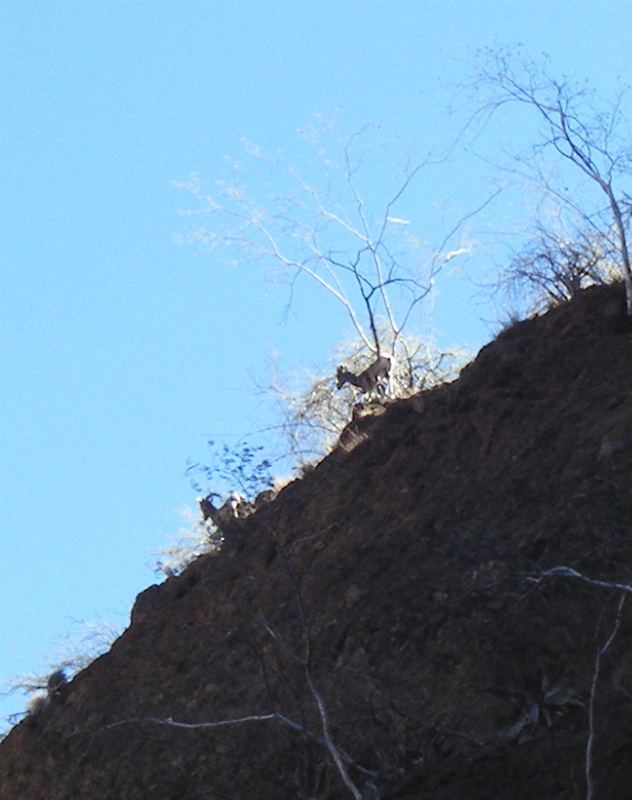 This last trip we startled 2 California Bighorn Sheep from their drinking. This is a very rare sight and we were really lucky to have got a couple of shots of them. We also spied a Ringtailed cat that scampered quickly away. Like Tabour, Wow comes to and end by a pool and again, those who are experts can go on if they like, but we eat our lunch, then head back, admiring the views that we missed on our way in as we head out. A trip through Wow generally takes 8 hours and still, no one every really wants to leave this magical place. As you can see, unless you're a rock climber, this is the end in Wow. 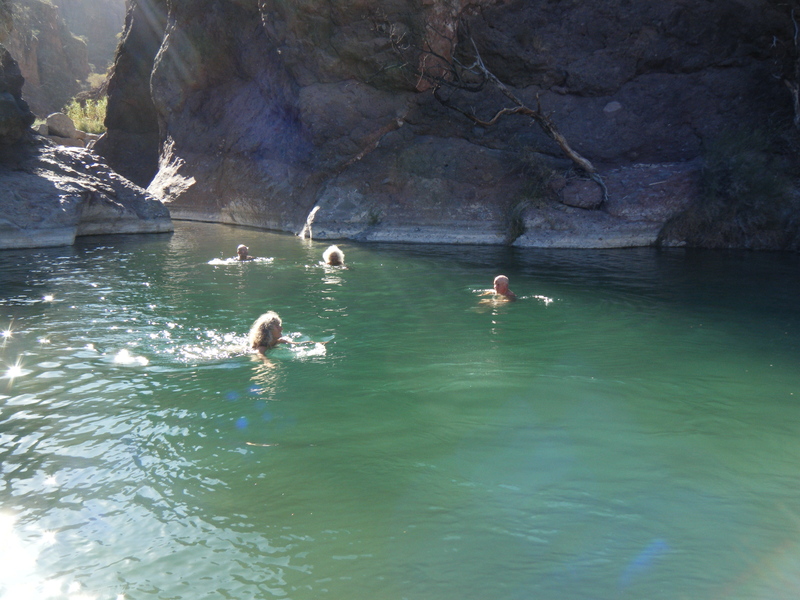 Wherever there's water in the canyons, the sound of frogs can be heard. This pool we swim in Wow, just for fun. It's very deep and at this time of the year it's the warmest. Both of these canyons are filled with an abundance of animal and plant life supported by the constant availability of water. Even in drought years, there is water here. 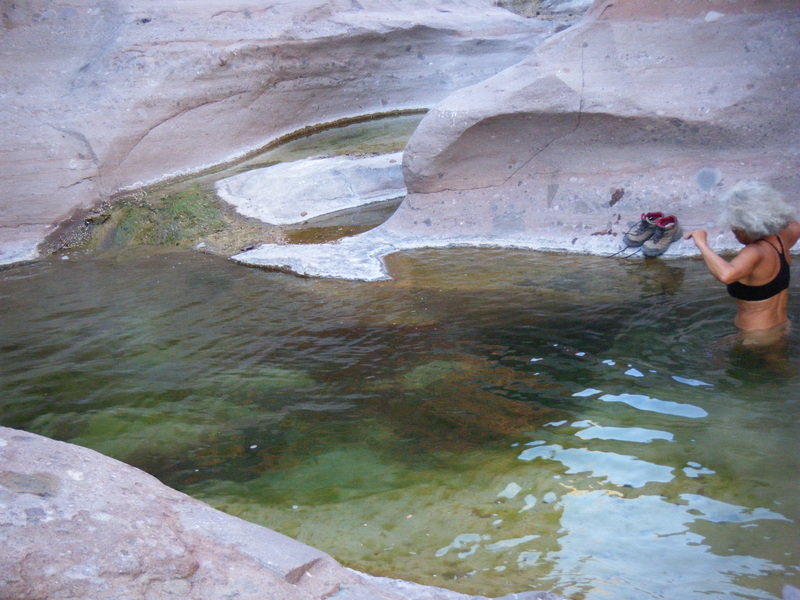 Some pools may go dry and streams flow under the rocks instead of above ground, but there is always water. Canyon Wrens sing their beautiful songs, frogs of many different colours and sizes croak to one another, flowers bloom in mass profusion, Fig Trees grow to enormous size, Ring Tailed Cats, Coyotes, Bobcats, Sheep, and other wildlife come to drink and every once in a while the silence is broken by a few humans seeking a little exercise and looking for something to do while the wind blows. The end of a wonderful day! 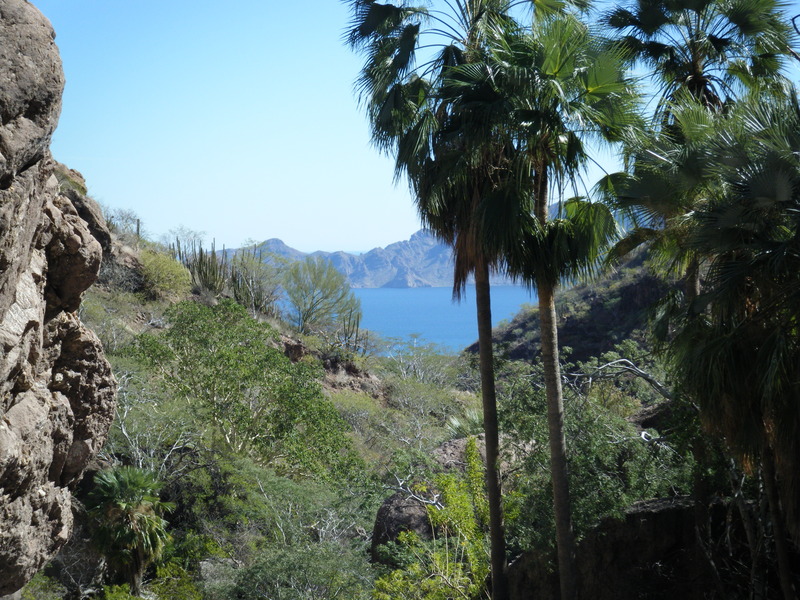 Southern Baja is a long peninsula with the Gigante Mountains running down the middle of it like a backbone. 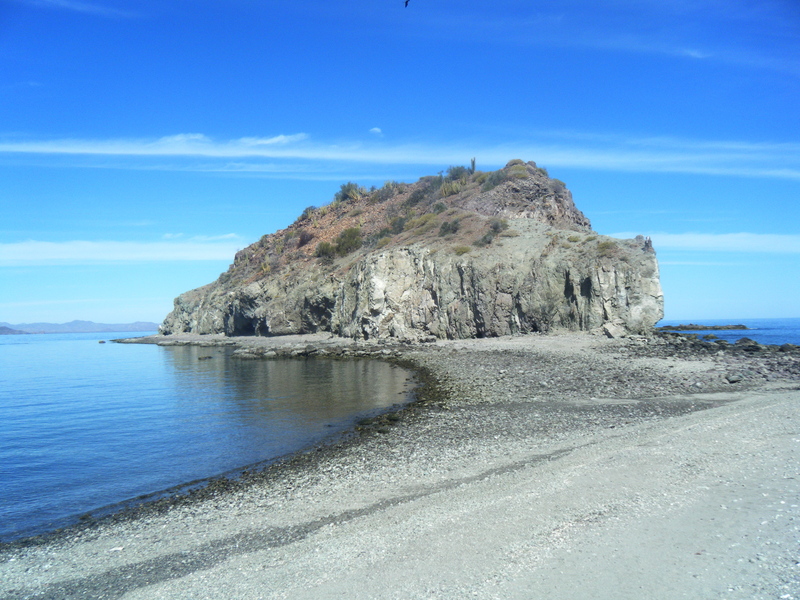 Rattlesnake Beach where we are is on the eastern side of the Gigantes, on a large Alluvial Plain, right at the foot of the mountains. 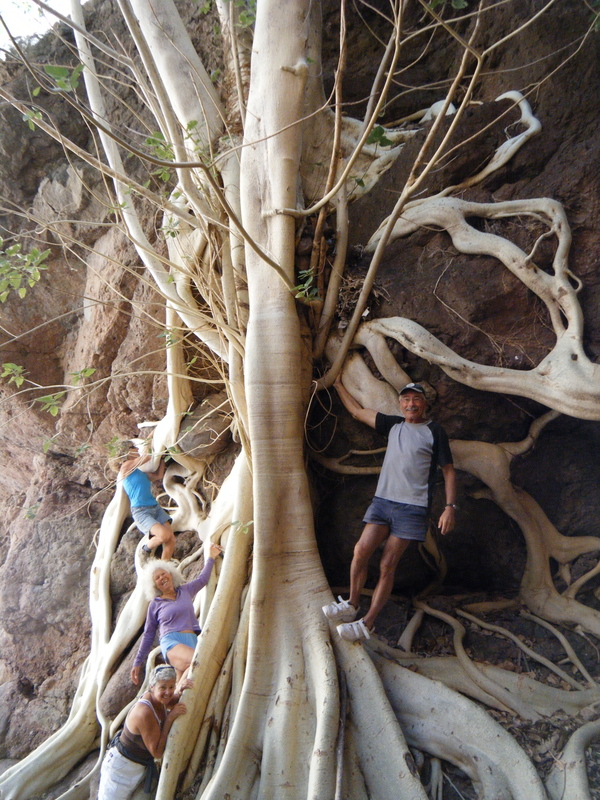 The summer months here are the wet season and rain comes from the western side of the peninsula, over the Gigantes and down through the vast canyons, gullies and out the arroyos. Every year the rains add to the gradual erosion of the mountains and brings fresh sand down out of the hills, to replace that which the Grande Norte blows away. 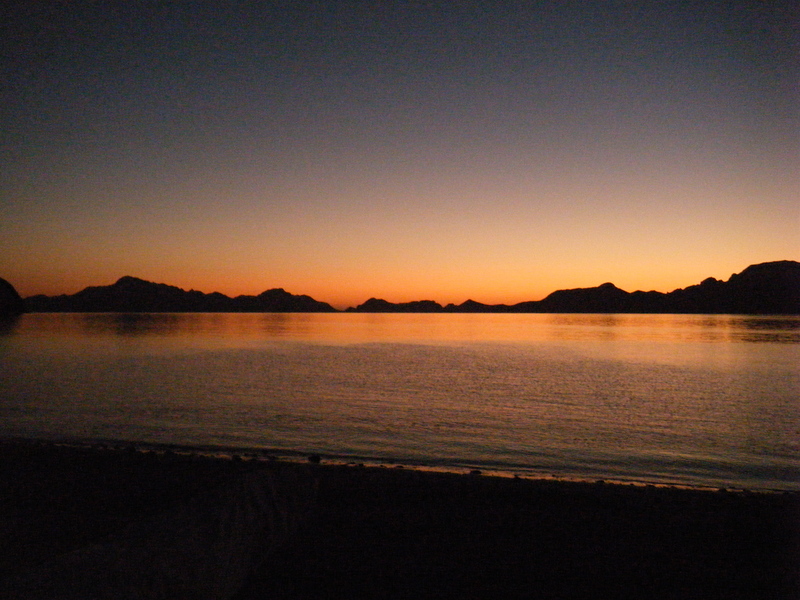 All of Baja is desert, but that doesn’t mean that there isn’t life here. 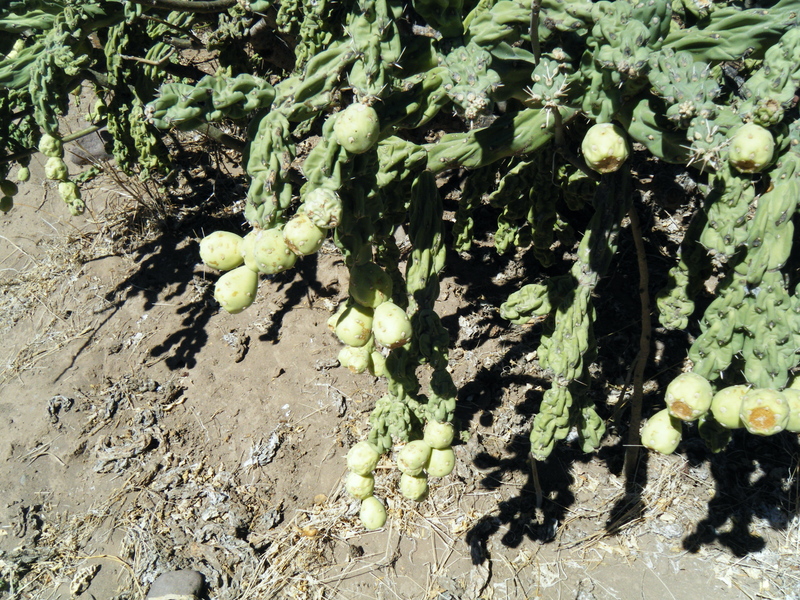 There is an amazing variety of it, but everything must struggle mightily to survive on the generally small amount of water that the rainy season brings. A scant 6 to 8 inches a year may be all that falls over an entire year, though sometimes it can come in one massive hurricane event. Hurricanes are rare this far up the peninsula, but there have been 2 in the last 4 years, the last one 2 years ago. Since then there has been drought conditions with little or no rain falling at all. 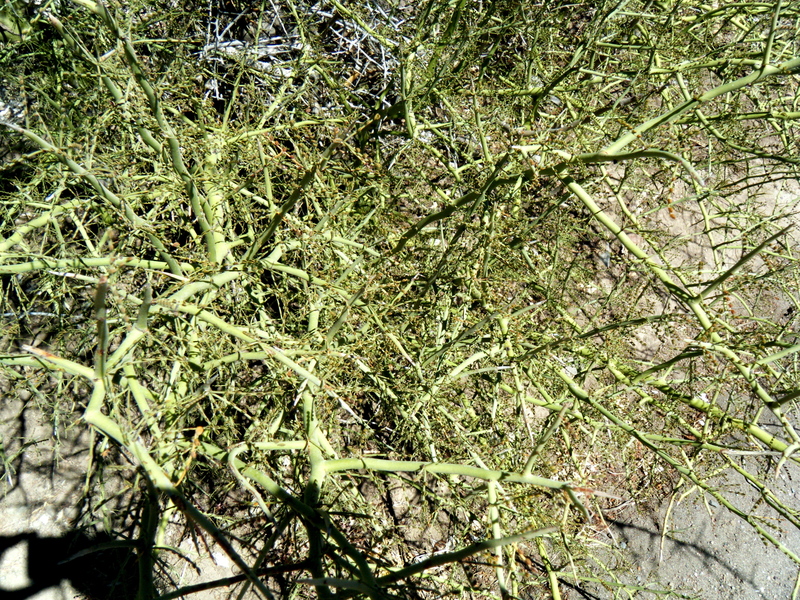 Consequently every plant must develop a survival mechanism, to take advantage of good rain years and survive low ones. They all have various ways to absorb and store water and to protect themselves from those that would steal it. 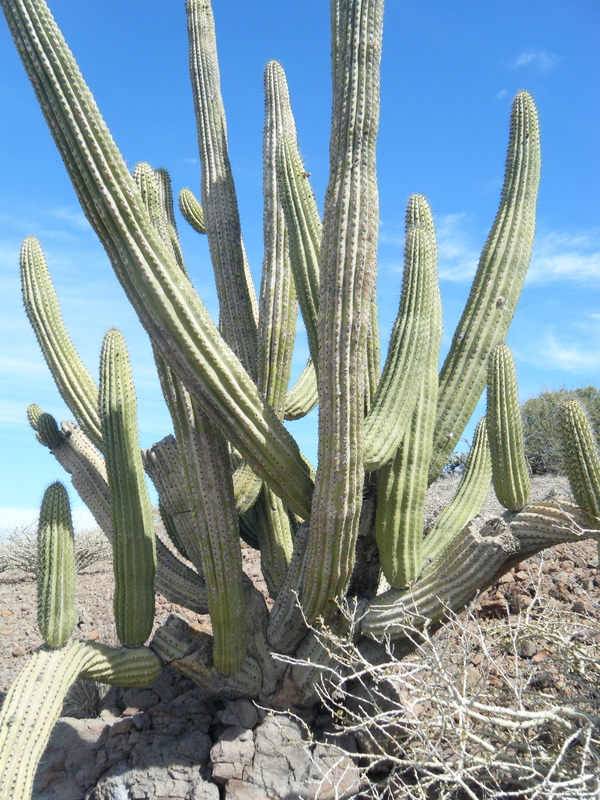 Almost all cactus are built like accordions and can expand hugely storing water for years. They also have spines to protect themselves and keep their water loss to a bare minimum, but so do almost all the bushes, shrubs and trees here. 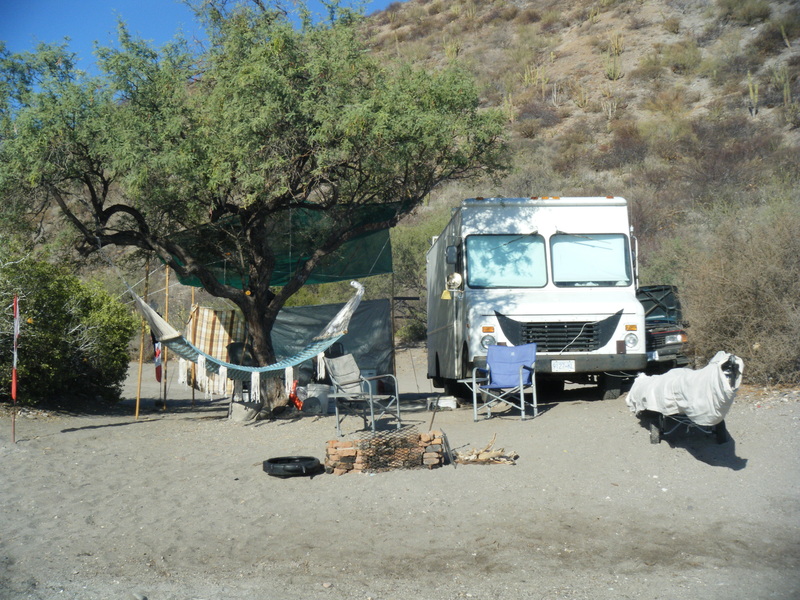 The Mesquite tree we have that provides us with shade also covers our campsite with nasty, thorny branches. 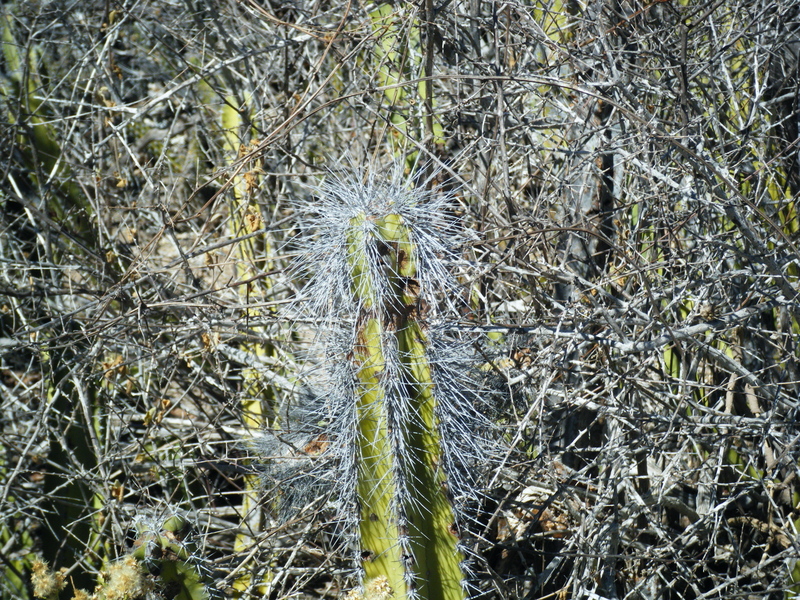 Take a close look at the photo below of the Palo Verde bush, you’ll notice that every stem and branch ends in a very sharp point. It doesn’t have it’s leaves right at the moment, but they also end in daggers. They say a picture is worth a thousand words, so here in a few photos is the natural world around us. 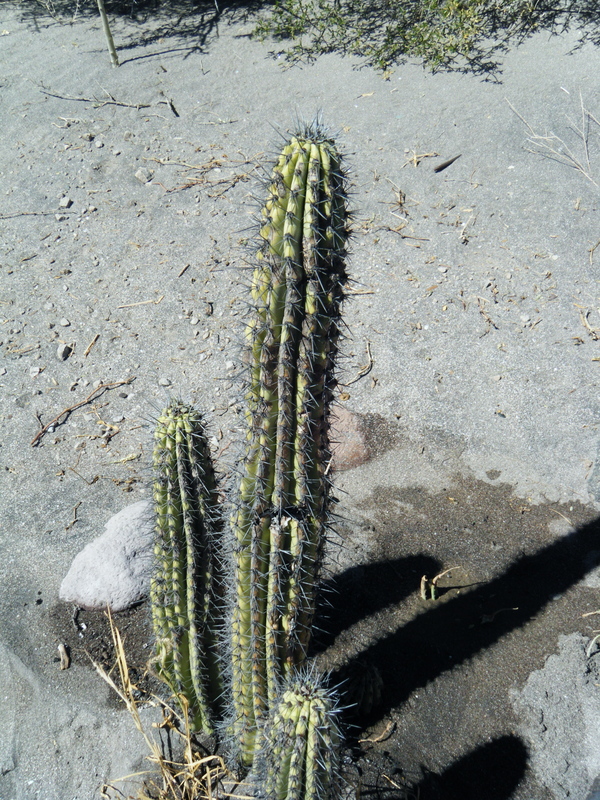 These are just a few of the many varieties of cactus that grow on the flood plain behind our beach and on Still Point Island on the north end of Danzante. 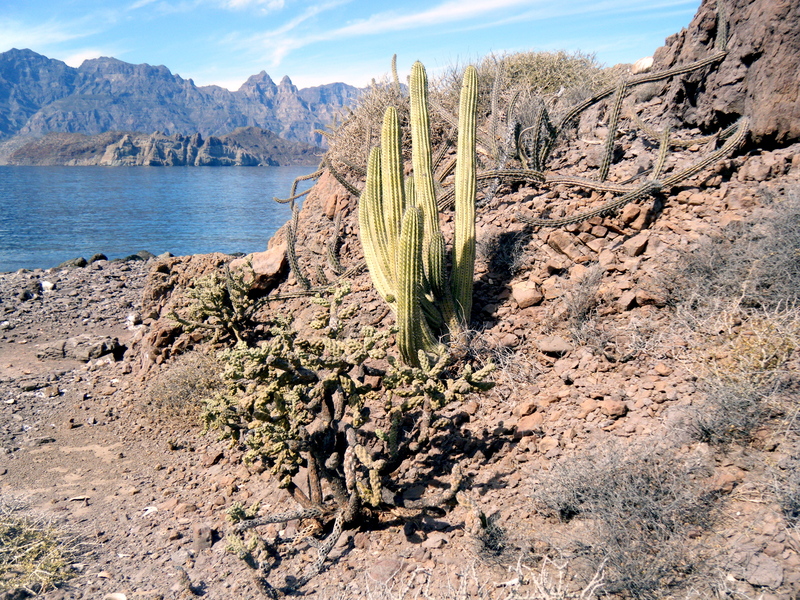 I could include many more shots of all of the various other types of plants that carry deadly weapons around us, but I figured these few would suffice to give you a basic idea as to how careful one must be when going for a short walk in the wilds of Baja! At high tide the land bridge disappears, and Still Point assumes it’s name! When you wander the islands, you must pay a great deal of attention to where you put your feet. 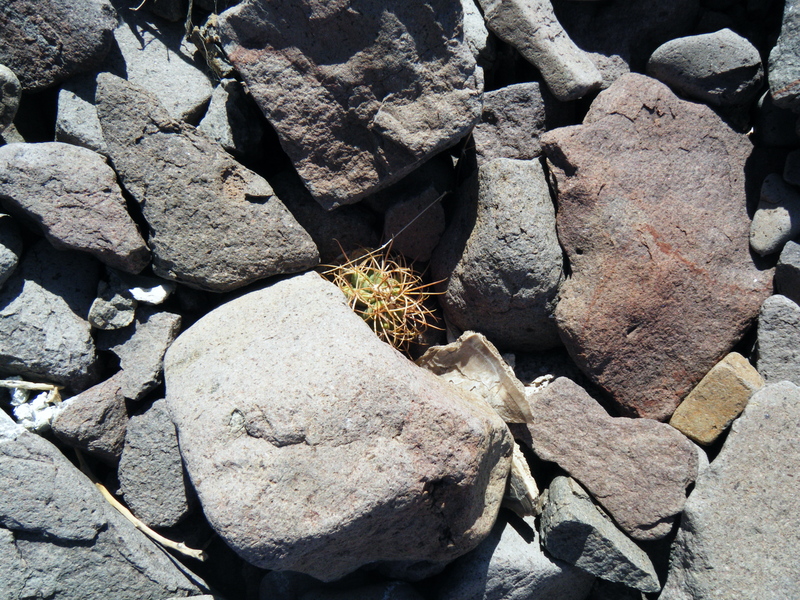 The cactus can be very small and they blend in and hide very well! 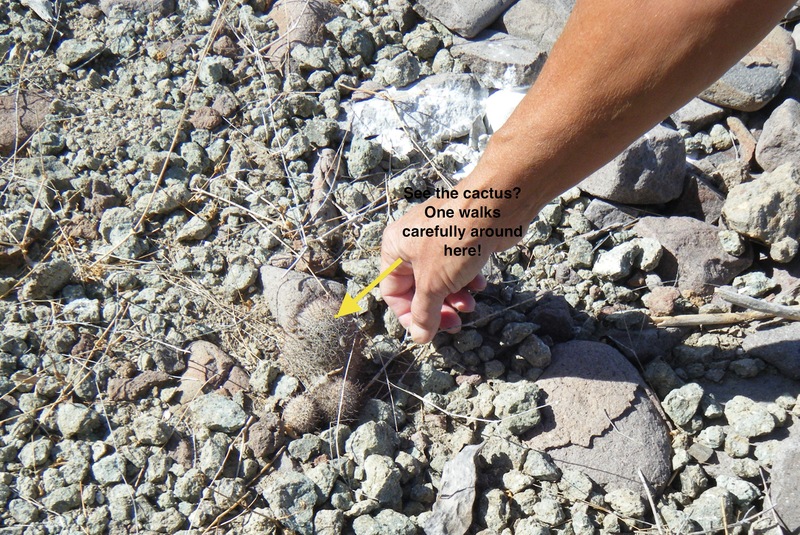 Fish Hook Cactus, blending in! It seems scary I know, but you get used to it, just like everything else in life. Sometimes it seems as if you’re dancing as you move along any path, zigging and zagging to avoid those plants that reach out for you. After a few bloody arms, legs or feet you learn how to avoid the obvious, look for the hidden and wear thick soled shoes! You always have to pay the Piper! We come here every winter obviously because it’s warmer than anywhere in British Columbia. The sun shines virtually every day, the temperature sits at a balmy 22c, on average, and if it clouds up and rains, well maybe 20 rain drops will fall from the sky. Ok, once every winter we do get a downpour and it can last an hour or so, but for the most part the weather is pretty awesome. It might not be the tropics, but it’s pretty close and it’s good enough for the folks I hang with. 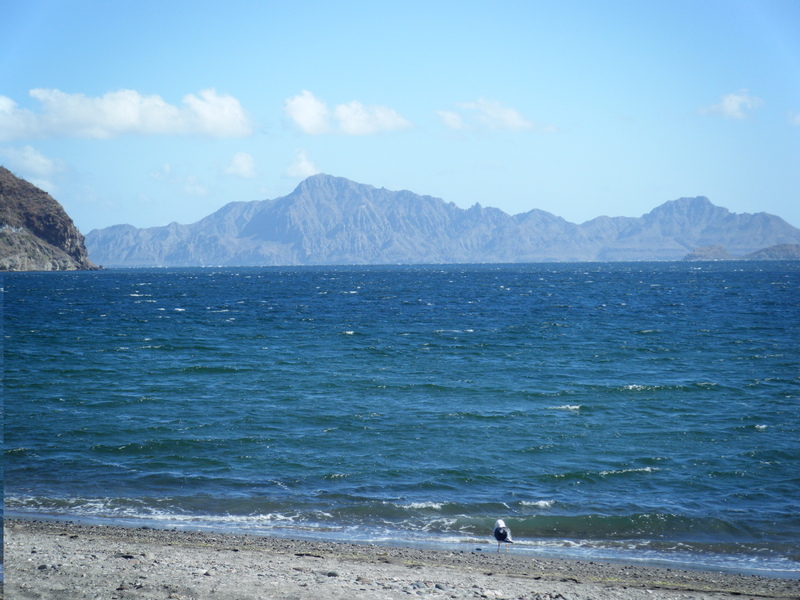 There is however, a price that must be paid for this…..El Grande Norte, The Big North. This is a wind that blows pretty much every winter, down from the north. It can start anywhere after the end of November and blows on and off until April. ...to this, in less than 1 hour! Some years it’s like living with a raging gale that just never seems to let up, and then you get a year like this one, were the winds have for the most part, been fairly gentle. All this winter we’ve had winds that have averaged between 5 and 15 knots, with lots of days with little or no wind at all. At least until last Tuesday! The Grande Norte came for a visit last week and hasn’t really left, he’s just taking a momentary rest. The view for 5 days. Cold and very windy! February is the month when the winds are at their worst and this is the time most of the Kayak companies have the bulk of their trips out to the islands. Imagine paying $1200.00 to come to Baja for a week of kayaking beautiful Carman Island only to be trapped on a beach by winds exceeding 50 knots (That’s 57 miles per hour or 92 kilometres per hour for those of you who are not nautically minded), not even knowing if you’ll be able to get back in time to fly home! We’re talking 8 and 9 foot waves here folks, and most of the folks who come for these paid excursions have absolutely no kayaking experience!. Not only that but it can come up so fast that it’s easy to be fooled and over the years some folks have died, either because they didn’t realize how fast the weather was deteriorating, or because they figured they had to take the chance to get back for their flight home. Now I must interject here and tell you that the Guided Kayak adventures have NEVER lost anyone, so you’re safe with them, but it can still be a miserable trip, hunkered down in your tent for days on end, unable to even go hiking because the wind is so strong it can knock you off your feet and do damage to exposed eyes and skin. To add insult to injury, the sky generally remains clear and beautiful during these major wind events! Some 7 years ago, 3 Canadians, one of whom was a Kayak instructor, were caught because they assumed they knew what they were doing and had a flight to catch. They left Carmen Island in the middle of one of the worst storms seen in years, and they ended up tossed out of their kayaks. The water here is definitely warmer than at home but you can still die from Hypothermia in 18c water, it just takes longer and that’s what happened to the Instructor. The other 2 managed to get back into their kayaks and were eventually found alive, but the instructor stayed under her kayak trying to keep out of the weather. She had a VHF radio with her and called and pleaded, but no one could get a boat out to her and there is no Coast Guard here. She eventually succumbed to Hypothermia and died. Those who had listened, were so shaken by the experience that they got together and created the Puerto Escondido Hidden Harbour Yacht Club Radio Net. It broadcasts every morning at 8:15 AM and it is specifically designed for emergencies of any sort and to make sure that all who use the water know what the weather is going to be for at least 3 days in advance. The Kayak companies, sailors, anglers and those of us who just kayak for fun make sure we all listen every morning and organize our trips around that information. Since it’s inception, no one has been lost, injured or died. That’s quite an accomplishment! Standing out in this can cause severe sand burn, if you can stand at all! Now, back to last week. We were warned it was coming and come it did! It blew for 5 full days. Sometimes it sounded like the moaning and shrieking of an insane person, other times like the intake of a jet engine! The worst 2 days were so nasty and cold that we never ventured outside except to take the pictures you see here and for Richard to help the Fisherman next to us. His boat had broken it’s lines and was pounding ashore, so they tied it to our Suzuki and pulled it up the beach, out of the water. A useless effort to stop the boat from pounding on the shore! 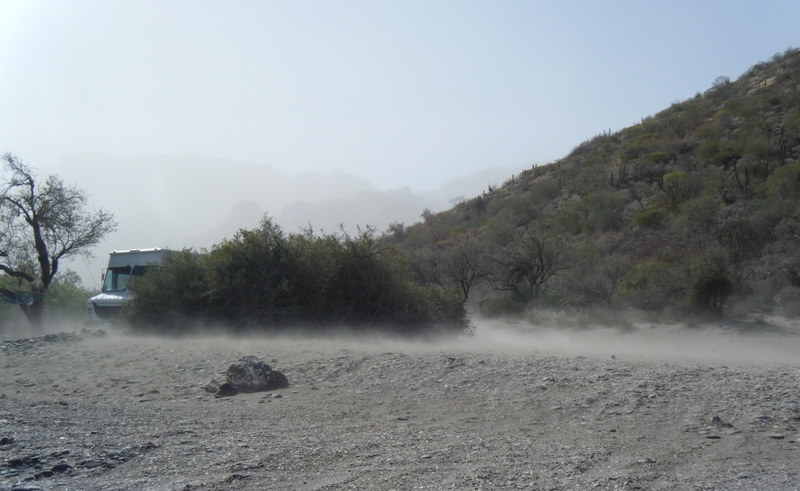 You’ll notice that Carmen, and Danzante disappeared, except that wasn’t fog or clouds covering them, it was sand and dust in the air. Grummy rocked, shook and swayed in the wind, and even though every window and vent was shut tight, we still had to sweep and dust constantly as microscopic particles pushed their way through the very walls it seemed. 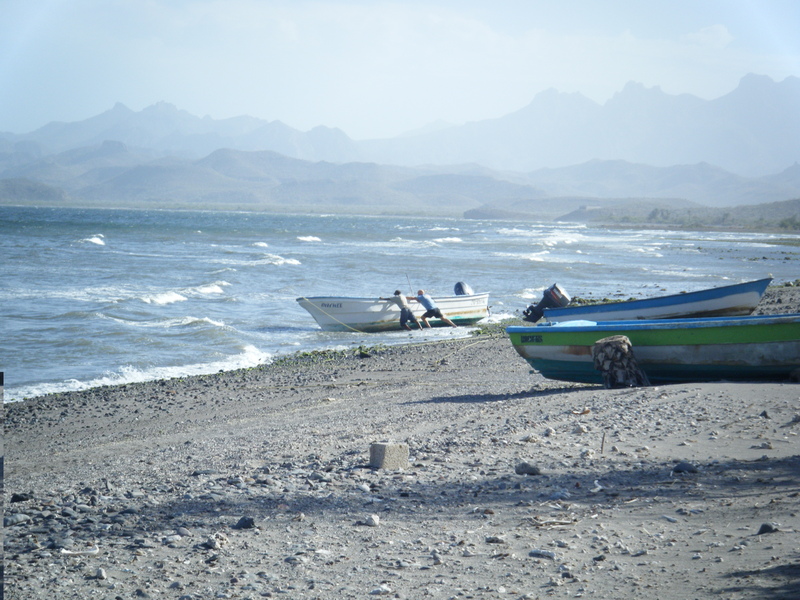 Generally, when the wind is too high for water activities, the folks around here will head into town or venture out behind the beach for walks in the desert. Not this time! No one budged from their warm hidey holes until Friday when the worst was past, human, animal, bird or bat! 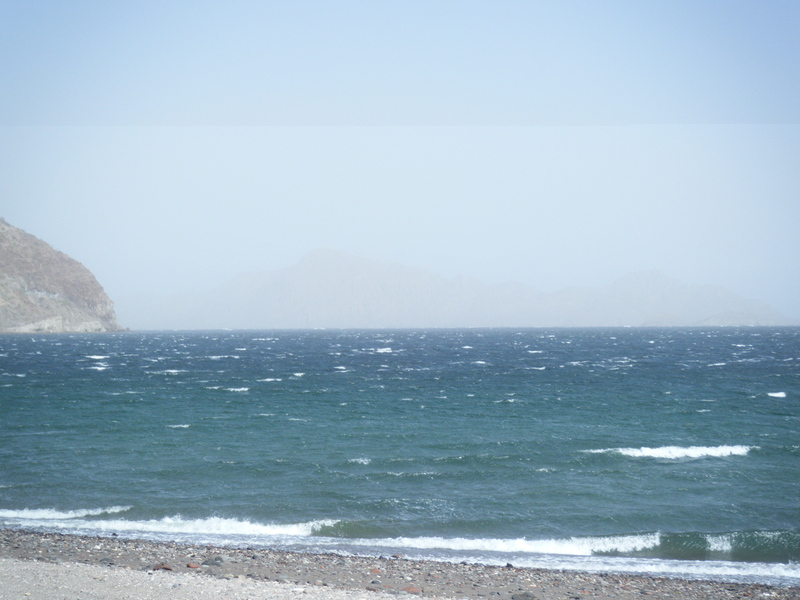 Not a one was seen until the wind dipped below 25 knots(46 kph), then gradually life came back to the beach. By the time the bulk of the storm had passed, our beach had completely changed. All of our lovely sand had been totally blown off the beach and was now up the road behind us. The rocks Richard had so carefully removed from our Kayak landing zone were now back, and there were twice as many than we started with. At one point, just below the locomotive sound of the wind, you could here the rumbling of rocks rolling under the waves. Broken branches from Mequite and palm trees littered the ground, and anything left outside needed to be rescued or dug out. The folks in the harbour are still trying to find and/or return all the lost articles blown off their boats. The locals say that this last blow was one of the coldest and windiest ones ever. We not finished either. We’ve had a bit of a respite, with Sunday and Monday calm enough to get out and clean up, even to sit outside and enjoy the warmth of the sun, but it’s coming back! Tomorrow it’s supposed to start again and blow for another 4 or 5 days. Then after that, who knows? It could continue for weeks, gradually fade away or simply just stop and go back to the weather we’ve enjoyed up till now. 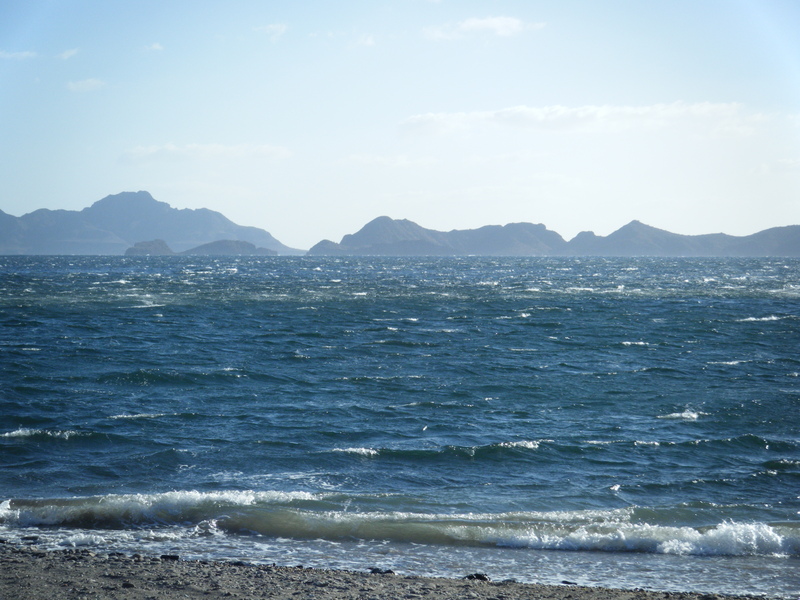 There’s always a price to pay for everything, and for us El Grande Norte is the price we pay for the warmth, serenity and beauty we get to enjoy down here on the Baja. You just never know when the piper will come calling.